Web notetaking – research evolution or poor wiki spinoff? Jose Ripiajo had made “Web notetaking. Google Notebook, NotePub or Luminotes, what is best?” suggestion in my sidebar Skribit widget. Which puzzled me a bit (I like being puzzled – keep those good suggestions coming!) because I never really understood online notetaking paradigm. So by reader’s command I had to enlighten myself and share what I discovered. There are few different approaches to web notetaking but basically it is saving part of web-page or just text for further use. Biggest challenge here is that Internet is built around links – in live or local (bookmark) form. Handling part of page seem like simplifying but it actually makes process more complex (comparing to storing link) and increases amount of information that must be handled by software/service and user. I am using notetaking (contradicting me) in form of Opera Notes function. I briefly described it in the post on simple form filling. doesn’t try to provide a lot – just enough to save few lines of text. Development was recently stopped (Google probably not too fond of notes). Greeted me with “Opera is not supported” crap (Google definitely hates Opera). It seems this one was bit of secret agenda in suggestion because Jose has it listed as home page in his Skribit profile. As any flexible tool it can be used in different ways and developer(s) used that as excuse to dump on visitor ton of those right from the start. Really – would you trust service you just encountered to become your blog, chat and email substitute. All at the same time? It looks decent and is easy to use but I just stared at it and couldn’t think how can it be useful to me. Service tries too hard to fill too many shoes. It should slow down and find some focus. Two separate products – shareware offline application and freeware/payware online service. Why separate? It is weird to see offline product that cannot sync with online version of itself. They do promise sync in the future. When it comes to feature promises future can be very far. Online service has plenty of paid plans with tiny free one in the corner. “Opera is not supported” crap. Design and usability of online service are excellent, I was awed – especially by use of white space comparing to tightly packed NotePub. It does really good job of slowly explaining itself as well. Luminotes seems like they took wiki and carefully removed all complex functions. Downside – free version does not allow sharing editing, making service useless as free collaboration tool. For pure research and working with text WikidPad leaves most of software in the dust. And online services I looked at cannot even hint at something that could make them more useful than WikidPad. Why bother with online service when desktop applications are faster and better? Online services have strong advantage of sharing and collaborative functions. However there are extremely useful and established ways to work with those like forums and regular wikis. I can get up my own wiki up and running in few minutes – about as long as it takes to go through registration process for online service. There is no shortage of free personal wikis online as well. Notetaking that works like wiki but hides internals from users cuts wiki potential by half. In my opinion online notetaking doesn’t serve clear purpose and tries to adopt and adapt tools that are better in pure form. I will keep using WikidPad for research and large amount of text. I will keep using Opera Notes – it doesn’t require any subscriptions and is always available. I will keep using hosted solutions (like this blog or wikis) for complex tasks and collaborating. 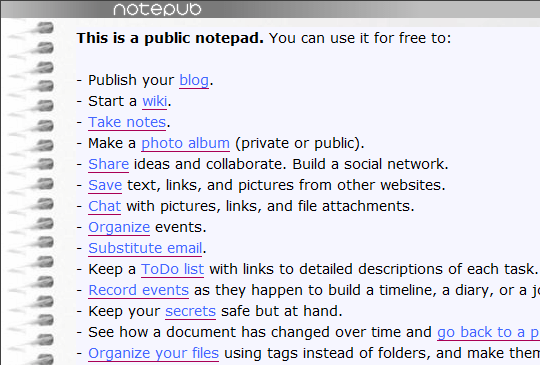 I will probably keep staring at online notetaking services and wonder how are they useful. Do you use notetaking services? In any case please share your opinion on them in the comments. « Did you know Internet has an archive? I’m surprised that you never checked out the web-based component of Evernote. I use the desktop version of Evernote primarily, it provides quick access to my notes and it serves as an inbox of sorts for anything that I may run across during the day that I would like to clip for later on. It’s a great service, and it even supports OCR in the web-based version. If you’re looking for a good note taking program, at least check out Evernote. Who said I didn’t? :) It was just out of the scope of services suggested for post. If I remember right Evernote charged money for portable version and it was big turn-off for me at that time. Evernote is certainly powerful app. But again – what can it do what I can’t with bookmakrs and notes in Opera? I admit I may be simply “not getting” notes. :) So I am eager to here comments and examples how are they useful! Note taking for me is simply a way of organizing myself. Whether I am at work or at home, I need to be able to gather all my thoughts into one place. To me, that’s what Evernote is. I’m a pretty big productivity geek, and for me something like this is vital. For me, when I am working on anything, things normally pop up. A friend may send me a youtube link, a client may send me an email. Any number of things may happen, and committing them all to memory, or even scraps of paper (which I tend to forget in various places) is a no-no. For this, I use Evernote. I always have it open, and if someone sends me a link, I WIN+TAB over to the window, paste it in to a notebook I hvae called Inbox and then don’t look at it again. Next time I find myself with free time, which usually happens towards the end of the day, or during lunch, I’ll pop open that notebook and begin organizing things. I’ll try and sort things into various notebooks depending on what I need to do to accomplish them. Say I need to email someone tomorrow, well it goes into my “To Do” notebook. Say I need to watch a youtube video, it goes into my “Maybe/Sometime” notebook. In that way, I filter down all the rabble that I would normally go through. Then, as the day wears on I go through these other notebooks and work through them. I have the benefit of being able to browse the internet at work, so I during lunch I may pop open the web component of Evernote and then go through whatever I can there. As to your remarks about how bookmarking is similar. It is. But for me personally, I get rid of my bookmarks folder. I rarely bookmark anything,and instead I just snip pieces of pages that I would want to refer to constantly and store them in a Reference notebook. I tag it with something descriptive so that I can always access it. To me a web-based note taking application is completely necessary. As a web-developer, I normally have at least two or three different browsers open and I’ve tried the Opera notes feature and it’s great. But ultimately, the quick use/discard feature is what prompted me to move away from it. It’s great for storing something you’ll need a few minutes later, but storing images or websites or smart bits of code isn’t feasible. Don’t get me wrong, note taking definitely isn’t for everyone. Some people already have a system in place for dealing with things and it works great for them. But for those who are having a hard time, then I definitely suggest looking in to it. It takes a couple weeks to build up a habit for actually using your system, but it becomes worth it. Yeah, I understand organizing purpose but for me bookmarks are more than enough. I see notetaking as extra bulk I don’t really need. Probably clipping parts of pages is core function in notetaking and I simply don’t need it. Bookmarking page is easier and if I need offline access I usually save it in MHT format. Thanks for awesome and extensive comment! :) If you have any question/suggestions for me be sure to comment or drop them in widget so I can return favor with post. Thanks for the mention of Luminotes. 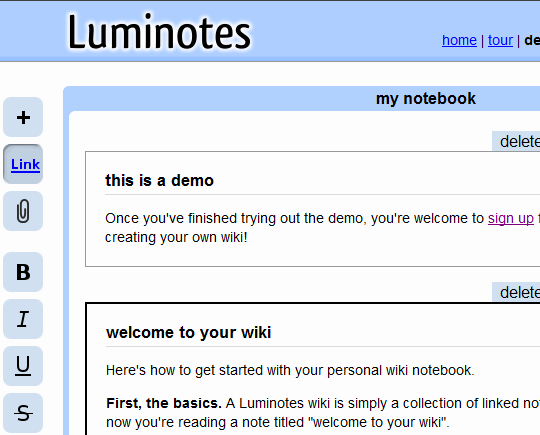 I encourage everyone to check out Luminotes and decide whether it meets their needs for online notetaking. And either way, please feel free to contact support and let me know what can make it better! Another vote for Evernote here I’m afraid, Firefox integration and ready on your desktop. Handles pdfs and other files really well and synchronises with online backup. Firefox scrapbook extension is also handy for taking online notes. Seems plenty are into Evernote. :) I don’t know should I feel old-fashioned with my bookmarks or way too geek with creating my own wiki when I need to share some notes. The “Copy to note” and “Insert note” function in Opera comes in real handy sometime, mainly to store comments/URL temporarily, then paste it. I gave up online note taking service some time ago. Despite all the functions – images, links, fancy colors and highlight etc, it still feels like something is missing. Eventually, the traditional pen and paper method still works best. For links that might be useful for further use, there’s Delicious. I think the problem with some such services is actually too much fancy. By the way never got into Delicious either. Again – Opera stores, syncs and offers online access to bookmarks. What more is needed? Maybe it is just me, but I have some trouble with Opera’s syncing bookmarks – it duplicates. I have to use batch scripts instead to backup opera6.adr into my USB drive. I use Opera’s bookmarks (or any other web browser’s, for that matter) to remember the main page of an useful site – Rarst.net for example. And I try to keep em minimal. While Delicious, it stores links to specific post. Eg “How to create pagination in JSP” or “Auto-resize image in a post” that I can refer from time to time. Or, certain posts about software that I might find useful in the future. Delicious tagging system is useful when you wanted to search through hundreds of your bookmarks. and want notes available between machines when not home. See Dropbox. :) It is very good at just that – getting same data on multiply computers. And with cloud storage part they don’t even have to be on at same time.